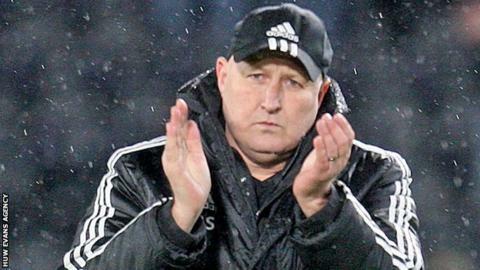 Cardiff City boss Russell Slade has insisted he is still the man to lead the club to the Championship play-offs, after Wednesday's 2-0 loss at Hull. Slade says his dialogue with the club hierarchy remains "very good" but there have been no talks over extending his contract beyond the end of the season. Asked if he remains the man for the job, Slade replied: "Of course I am. "I believe in what I'm doing. I've done 750 games with a win ratio of about 39%. It does not mean I am a mug." Slade was also asked if contract talks had begun. "No, not at all. We have a very busy time, as it is January now, to ensure we can improve and push on," he answered. Cardiff remain seven points adrift of the top six after their defeat against Hull City, who are up to second. But Slade is adamant the Bluebirds, who travel to Wolves on Saturday, can reach the play-offs. He added: "I am capable and I still feel I am capable of getting this team into the top six." Earlier this week it was reported Slade was "on the brink" of losing his job but he said: "As far as I am concerned the dialogue with the chairman and chief executive is very good. "We are all wanting to the same thing." Slade would not speculate on whether he would be leaving the club if they did not reach the play-offs. He said: "I have no idea. I have not even contemplated that. "You cannot look that far ahead in football, it is just the nature of the job." Slade said he understood the frustration of fans, some of whom have vented their anger on social media. But he added: "I can only do my best, week in and week out, the same as my staff. "We need to ensure we are doing that continuously. "At the start of the season I think there was a poll that suggested 1% said we would (reach the) play-offs, 2% said we would be in the top ten - that tells me 97% are wrong. "But we still have a long way to go, we still have a lot of work to do. "We know we are behind now, we know what we have to do and it is time to roll our sleeves up and get it done."